We arrived as mere spectators. We watched a few other brave souls go, with no intention of jumping ourselves. 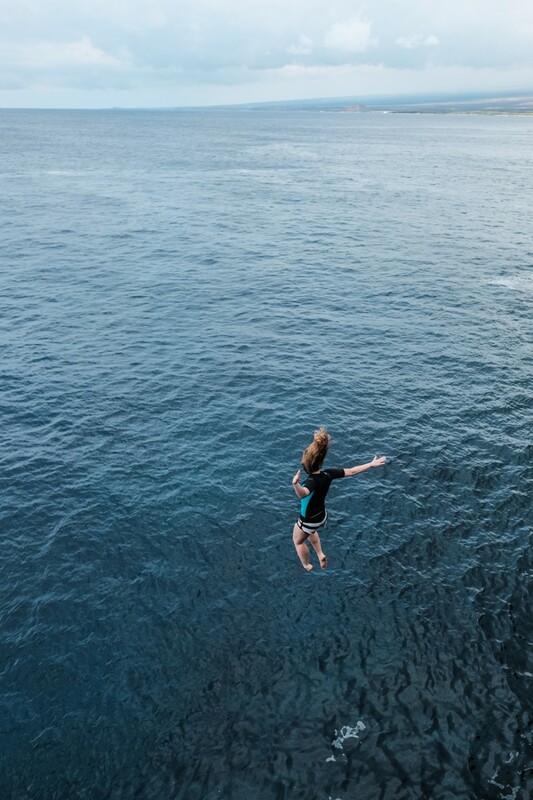 Then I thought maybe I’ll jump. My brother jumped, and then I reconsidered. The 40′ drop (12 meters) really didn’t look as high as it did in the pictures. If you’re wondering exactly how high the South Point jump is, most online records I found say 40 feet, though a couple I found said 50 or 60. From experience, I think 40 is probably the most accurate. My heart was racing, but I started my momentum forward and didn’t stop. And then I was falling. Fast. You reach the water way faster than you think you will. Splashdown (and a big nose full of water)! I landed feet first with my arms straight out to the sides. I ended up with a superficial bruise on the underside of my arms from the smack. The girl before us didn’t fare so well and ended up with huge swollen bruises on her hamstrings from landing her jump in a sort of seated position. You can definitely do this without bruising, by the way. I just couldn’t control my flailing arms. And then I was on my way back up. 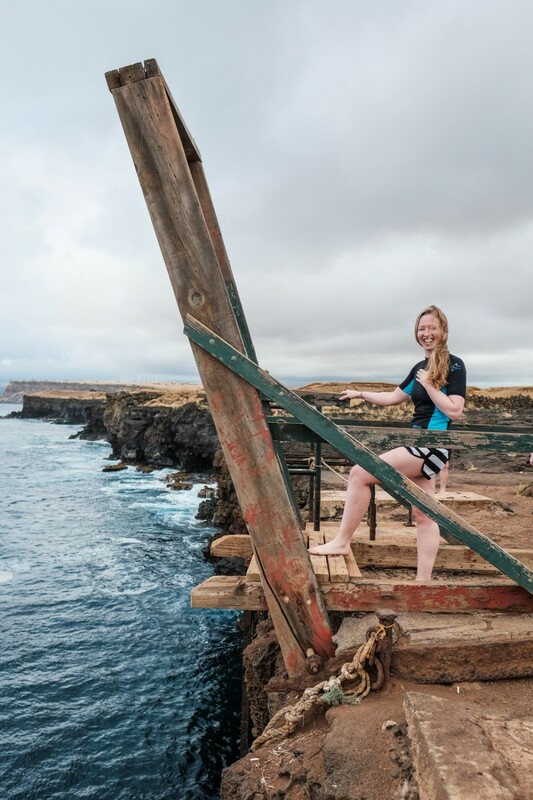 There’s a slimy, rusty ladder (which is supposed to be for fishermen) that you use to climb back up from the water. For me and my fear of heights, nearing the top of the ladder was actually the most terrifying part of it all. The worst part of the whole thing was climbing up this ladder! Happy to be off that ladder! We did it! Props to my brother for jumping first. 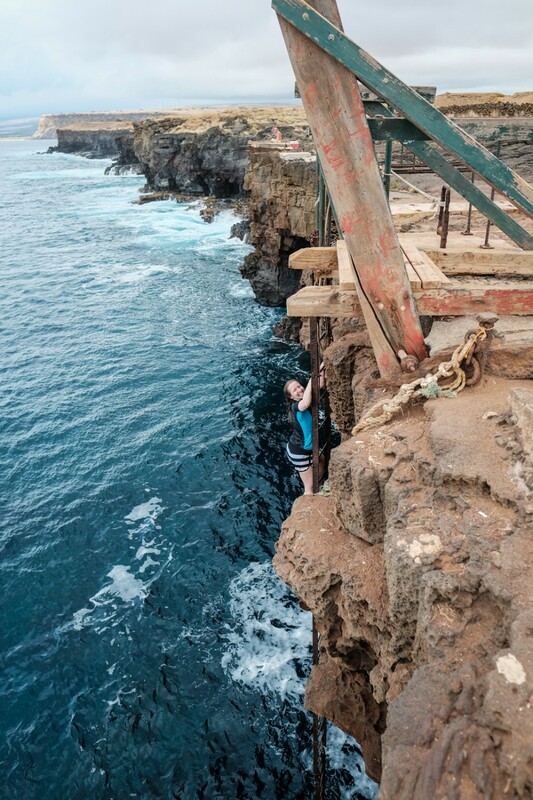 The South Point cliff dive platform (map) is actually on the west side of the island. So afterward, we walked down to the true southernmost point of the U.S. (map) to get the photos we came here for. Here I am at the actual southernmost point, where you can walk down to the ocean. In case you’re wondering, Ian didn’t jump. He was the photographer for this adventure! I’m planning to do more thrill seeking adventures in the near future. Be sure to subscribe and like us on Facebook so you don’t miss out on any action! 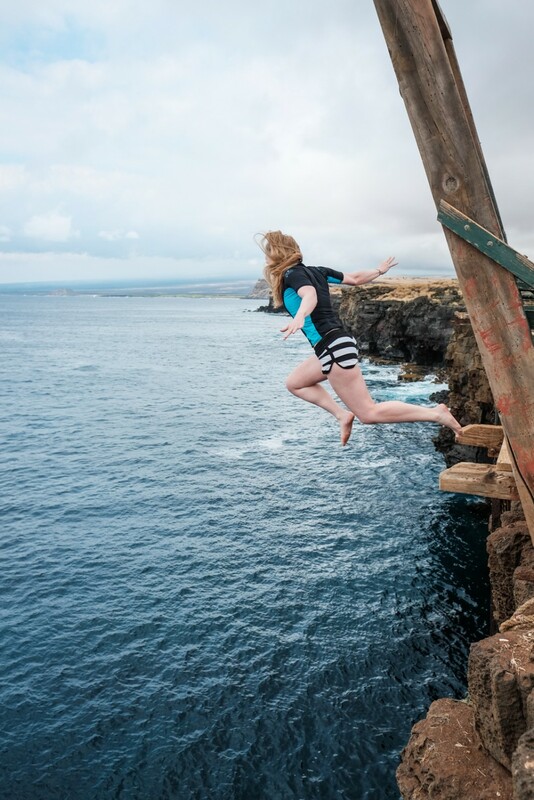 Have you ever jumped off a cliff? Where do you think I should jump next? Tell me in the comments! Ahhh I could never do this! I HATE that feeling of falling in your stomach! This looks insanely high!! 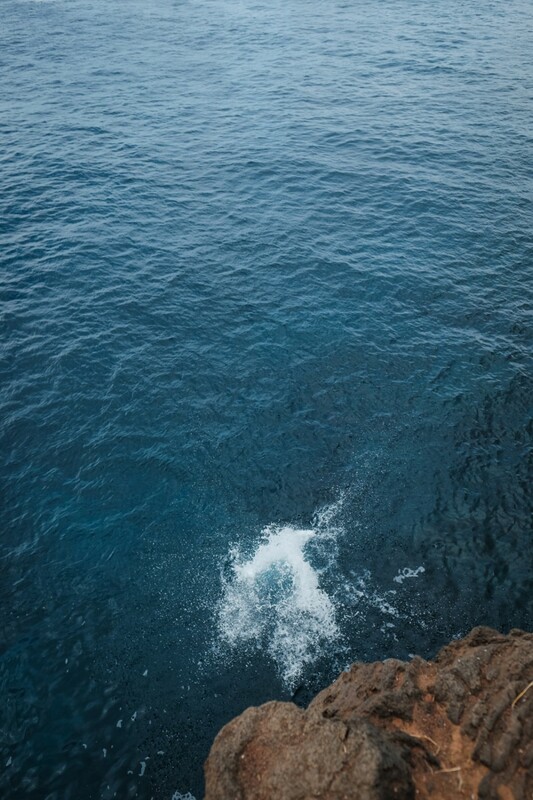 I jumped once into a rock pool in Malibu… I think it was maybe only 15′ or so and it took me like half an hour of gathering up the courage. Good job on conquering your fear! It definitely helped watching other people go first and also not spending too much time overthinking it. I bet you could do it! And I actually had a similar experience to yours in Malibu before this… but embarrassingly enough, it was at the Malibu Community Pool’s high dive, and it was maybe only 10′ up. I flailed that time, too, and had much worse bruises to show for it. Granted, I was trying to dive that time, so I went in at an awkward angle. I did this some years ago, twice. 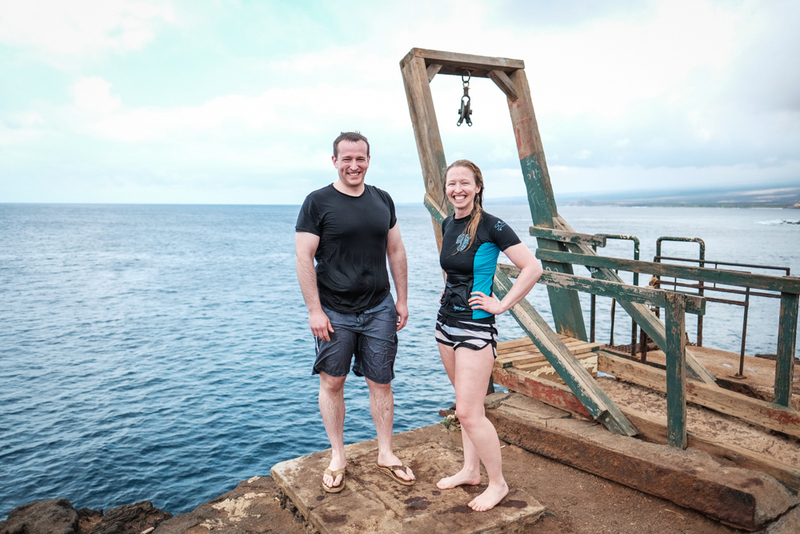 Locals told us it was 45′ high, but it sure seemed higher as the water is surprisingly hard when you hit it. A friend who had been on the dive team in school did it feet first to test it, and see if he could dive head first a second time. After the first jump he changed his mind. I should also note that once you’re in the water, if you open your eyes the ocean below is astoundingly clear, especially on a sunny day. You don’t have to take the ladder back up, just to the southeast of there is a rocky path where you can climb out, and scramble back up to the top. That is so awesome that you did that. I’m going with my brother and sister in 2 weeks and I’m so excited!! Hopefully I’ll be able to pull through with it and jump. I’ve never done anything like this before! I’m so excited! 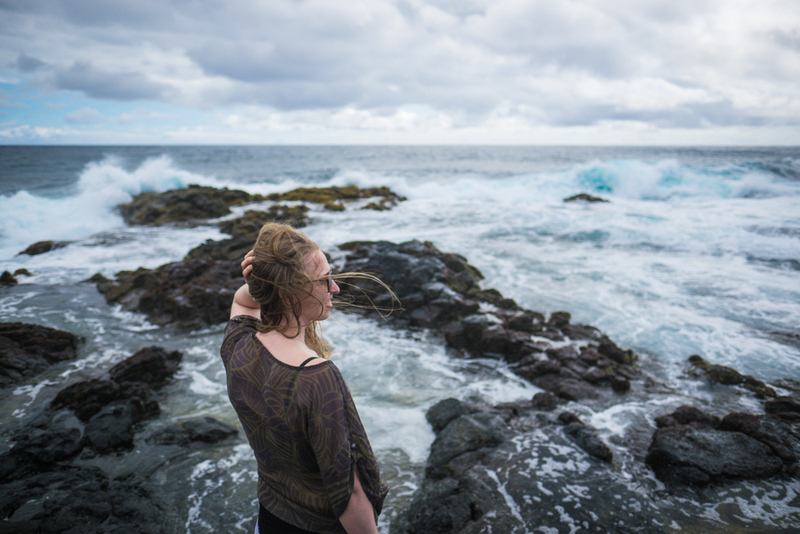 Do you know if you could get to Papakolea Beach from here easily? 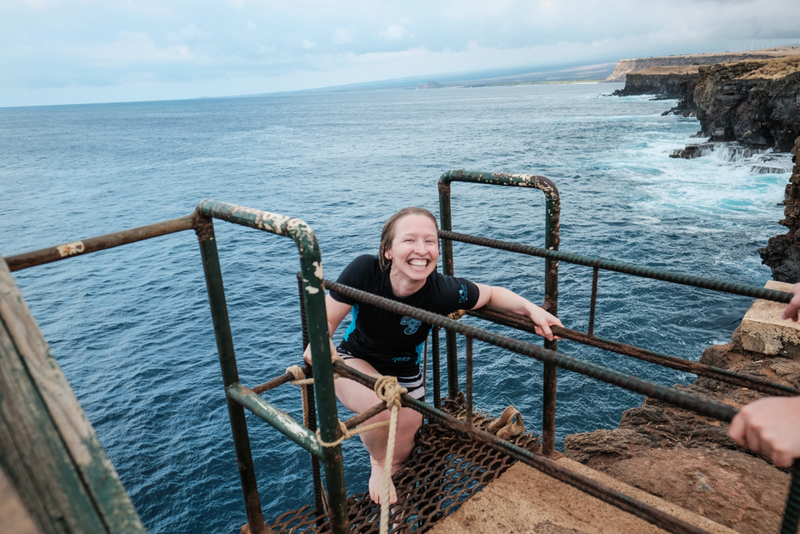 We did the cliff dive today and you will be happy to know that they installed a brand new ladder just a few days ago. The old one is still there and boy I am glad I didn’t have to use it!!! Isn’t it exhilarating? What a great way to kick off the new year!